VIR is one of our favorite racetracks. 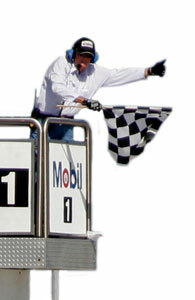 This year’s event included a Pro-Am race, similar in format to the Indy event, but with NASCAR drivers. Jim Kitzmiller was not interested in another Pro-Am event as the last three cost him big money. Clair Schwendeman was on the podium in the last two Indy Pro-Ams, and he wanted another bite of the apple. 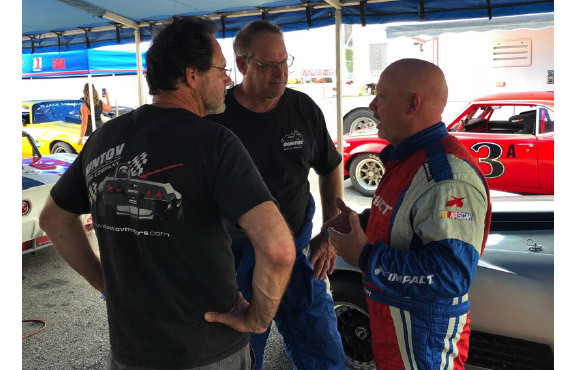 We were planning on bringing Tony Parella’s 58 Corvette, but at the last minute Tony asked us to take two Pro-Am cars instead; Mark Hilderbrand’s Corvette, the other an A/Sedan Camaro that would be a spare in case one of the other Pro-Am cars didn’t make it. It turned out to be a great handling car, but no power! Sure enough, on Friday Tony came over and asked Alan if he would drive the A/S Camaro with Johnny Benson. Who could say no to that? Unfortunately, it was like running a Sprite in Group 6, and the Alan’s focus became how to avoid being last! Clair was teamed with Ward Burton. Ward was an absolute pleasure to work with, and just a super guy. He is, however, over the top on ergonomics. The challenge was accommodating both drivers, given there is about an eight inch difference in their heights and about a two foot difference in where they want their steering wheel! The solution was to remount the seat, moving the base forward, the back of the base up and moving the top of the back forward six inches. We also used a seat insert for Ward and a different steering wheel for each driver. Ward’s wheel had a three inch dish; Clair’s was flat. Ward’s wheel ended up about six inches from his chest, right where he wanted it, while Clair ended up learning how to drive his car with a steering wheel about a foot closer to him than it was. Ward is telling Clair the dished wheel wasn’t enough – we needed to move the seat forward as well. Mark Hilderbrand was teamed with Todd Bodine, and like Ward Burton, Todd was all but a member of the crew. He worked side by side with Mark and the crew right up until the race. 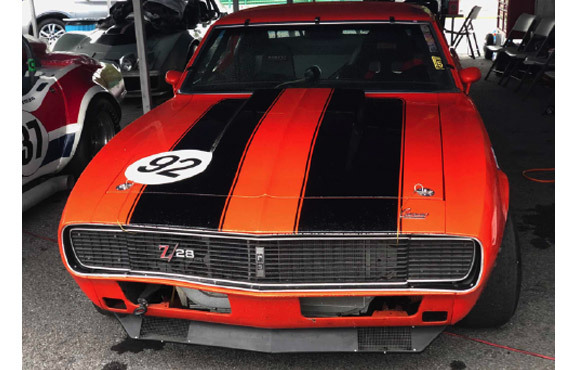 The A/S Camaro hadn’t been run since 2012. Its fuel cell foam had dissolved, so it took a ton of work before it would even run. We did get it running in time for Group 6 qualifying, and it wasn’t last – it was 20th out of 29. Mark qualified 5th, Clair 8th. In the pre-race lecture, the teams were told the pit lane would be closed in the event of a full course yellow, and that the amateur driver could only run 10 laps. Obviously, it was a good idea to get the pit stop over with early, in case a full course yellow came out on the eighth or ninth lap, which is exactly what happened. Those who planned on pitting at lap 10 ended up disqualified. 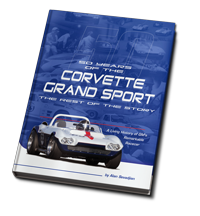 The Duntov crew was servicing three cars, and they were scheduled to come in on laps 5, 6 and 7. With both Mark and Clair in the pits for their mandatory pit stop and driver change, a full course yellow slowed the field and Mark and two other cars that were on the pit lane at the time rejoined the race a lap ahead of the rest of the field who had pitted earlier on green. Unfortunately, Ward was not exactly ready when it was time to go, as he wanted to check the radio! While that was going on, the pace car came by and he went a lap down. Once under way, Ward turned the fastest lap Clair’s car ran all weekend, but it was only good for 8th place. Mark and Todd Bodine finished third, and the A/S Camaro of Alan Sevadjian and Johnny Benson was a DNF due to trash in the fuel system. For us there was no Group 6 feature race as the track was wet Sunday morning and we had had enough. It was time to go home.